This piece was published in The Big Issue in March 2016. Darren Pauling has lived all his life in Poplar, the east London neighbourhood at the top of the U-bend in the River Thames. He can just about remember the Docklands before the huge towers of Canary Wharf arrived in the 1980s. His dad used to work down there, on the old wharfs, back before the arrival of enormous container ships forced the closure of the narrow docks. 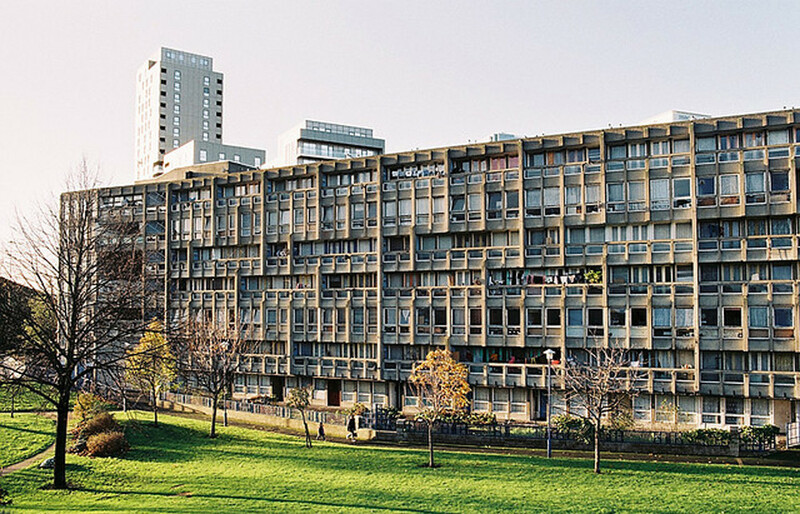 Robin Hood Gardens will begin to be destroyed this year. The local authority – Tower Hamlets Council – has decided its best-known estate is past its sell-by date. The site will be handed over to Swan Housing Group to replace the 252 homes here with more than 1,500 new ones – a bold scheme that will see more homes but less open space, a shift towards the private housing market, and a new generation of boxy flats replacing the old “streets in the sky”. The death of Robin Hood Gardens is both typical and extraordinary. Typical because the regeneration project reflects the long, slow demise of council housing nationwide. David Cameron has commissioned Michael Heseltine to examine how to demolish and redevelop the country’s 100 worst “sink estates” with the help of the private sector. Heseltine says it is his dream to get rid of the “slums”. The death of Robin Hood Gardens is also extraordinary because the buildings here make up one of most ambitious housing projects ever built by the state. The architectural buffs at the 20th Century Society are amazed and appalled such a significant chunk of concrete modernism will be pulled down after last year’s attempt to get the buildings listed failed. The husband and wife team Alison and Peter Smithson who designed the place actually coined the infamous term “brutalism,” and their ideas influenced the design of local authority estates elsewhere. Robin Hood Gardens looks, in its final days, about as drab and neglected as homes can be: broken windows in crumbling frames, cracks in the cladding, the weather-stained blocks turned a dirty beige. The place will follow the fate of failed concretopias like the Gorbals’ Queen Elizabeth towers in Glasgow and Hulme Crescents in Manchester, estates demolished in the early 1990s. Yet Park Hill – Sheffield’s big 1960s brutalist scheme – provides an example of an estate enjoying a second life after a major refurbishment by architects Urban Splash. Some Robin Hood Gardens residents – including Darren – fought to get their decaying estate this kind of renovation. Now that option is gone, Darren, 43, fears he will either have to pay more than his current £127 weekly rent to stay in Poplar or move out of the area to hold on to his council tenancy. Some of the east Londoners who have already left Robin Hood Gardens have suffered a painful squeeze on income. Shirley Magnitsky, 70, lived at the estate from 1995 until 2011. Aware of the council’s determination to get rid of the place, she agreed with housing association Swan to move into one of their new blocks of flats further north in Bow. Having lost the secure council tenancy she had at Robin Hood Gardens (£98 a week), her weekly rent with Swan has jumped from £120 to £137, and is almost £160. Swan, like many housing associations across the country, are being lured into the world of private development. Having inherited much of the nation’s council housing during the era of stock transfers, many of these bodies are now trying to “cross-subsidise” their low-income, ex-council tenants on social rents with new apartment blocks to rent or sell on the open market. Defenders of social housing are suspicious about where these providers’ priorities now lie. Last year London-based Genesis Housing Association announced it would no longer build social rented accommodation. Robin Hood Gardens’ replacement, known as Blackwall Reach (pictured above), will have 1,575 units across an expanded site but only 698 of the homes – 45 per cent – will be “affordable”. Affordable, remember, now includes “intermediate” rents being set at up to 80 per cent market rates. Swan say 80 per cent of the affordable homes will be available for social rent. Swan’s for-profit private development arm Nu Living is already advertising the non-affordable one and two bedroom apartments at the “highly anticipated development” next to Canary Wharf. This is plainly incorrect, and shows an astonishing ignorance of how regeneration schemes play out in practice. Robin Hood Gardens’ demise shows how disruptive it can be. Only 79 former residents have been accommodated in two new towers just north of the old estate. Some, like Shirley, have had to give up lifetime council tenancies and move out of the area. Others The Big Issue spoke to, families in Robin Hood Gardens’ four-bedroom flats, found their grown-up kids couldn’t be accommodated at smaller housing association flats, so young adults who grew up on the estate have been pushed into the private rented sector. And homeowners, offered sums far below local prices, are being pushed out of central London. Azezzun Zahraah, a 45-year-old care volunteer, has been offered £178,000 by the council for her two-bedroom flat at Robin Hood Gardens. It’s certainly not enough for her and her two daughters to buy somewhere in the area (according to Zoopla, the average amount paid for a two-bedroom flat in Poplar is £347,000). She has been offered a two-bedroom flat in the first phase of the new development but only as part of a shared ownership deal that would see her regain full ownership after seven years. Confusing letters about compulsory purchase have been coming through Zahraah’s door since 2012. It remains a hellishly long process to clear a council estate: endless consultation meetings; phase-by-phase drawings of sunlit uplands from the architects; weasel-worded, ever-shifting promises. The UK government’s housing bill, if passed by parliament in the coming months, will further hasten the downfall of council housingOne thing Heseltine’s 17-person regeneration panel aims to do is speed up the process by fast-tracking developers’ applications. And the UK government’s housing bill, if passed by parliament in the coming months, will further hasten the downfall of council housing. It seeks to end lifetime tenancies, extend the right-to-buy to housing association tenants, force the sale of high-value council properties, and introduces “pay to stay” charges for tenants in council houses earning more than £30,000 a year (or £40,000 in London). It’s not only pro-public housing lefties who fear the “social cleansing” of our inner cities. The former head of the civil service, Sir Bob Kerslake, felt it necessary to warn against a bill that “risks bringing about the end of social housing… it’s being written out of the script”. Some Tories remain instinctively grossed out by ageing concrete towers where lots of poor people live together. London mayoral candidate Zac Goldsmith thinks we have an “ethical obligation” to demolish these places. But if demolishing ageing estates is so important, where’s the inspiring vision for their replacements? According to the Royal Institute of British Architects, new homes in Britain are now the smallest in Europe. It’s hard to get excited about dense clusters of glass, aluminum balconies and brightly coloured cladding, especially if the only “affordable” rents on offer at the new high-rises are just below market prices. Critic Jonathan Meades recently wrote about builders being locked in a battle to “vandalise the sky with banality”. A post-war wave of council-built estates like Robin Hood Gardens promised to free a generation of poor private renters from slum conditions. It looks as though it will take another generation – and a slide back into overcrowding and squalor – until the state feels obliged, once again, to protect people from the vagaries of the market. Shirley Magnitsky, born at the end of the Second World War, can’t remember a time the search for decent housing has been so frantic.